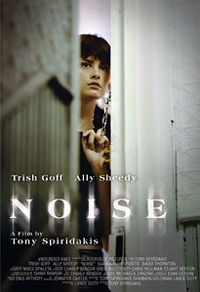 Anybody who's ever weathered the rudeness of a rowdy upstairs neighbor will respond instinctually to the art of Noise. You lie in your bed in torment as show tunes rumble through the floorboards at 4 a.m., their half-muffled sonorities the most disturbing sort of bedlam. Your indignation fights a losing battle with your fear of walking up the steps and confronting the sadist on his own turf; maybe you've done so already, and emerged petrified by the inhuman indifference you encountered there. There's nothing to do but give in to mental and physical fatigue as you thrash about in futility, wondering what could make a rational person behave so abominably… and what you'd be willing to do to make it stop. Such is the lot of Joyce Chandler (Trish Goff), a young divorcée and recovering alcoholic who moves into a Manhattan apartment that seems a bit too secluded to be true. It is: Upstairs lives Charlotte Bancroft (Ally Sheedy), who in addition to having one of the all-time-great thriller names is a sociopath of some reliability. A wall of obliviousness who can turn even an "apology" into a guilt trip, Charlotte persists in making Joyce's nighttime hours a living hell. As the torture continues, Joyce starts to lose her grip on her job, her health and her sanity. It's a heck of a price to pay for having your own place. Sheedy's Charlotte is a splendid rendering -- an idiosyncratic yet instantly recognizable reminder that renting property means exploring the dark underbelly of the aphorism "It takes all kinds." Yet the story (adapted by Lance Doty) takes pains to give alleged victim Joyce plenty of her own demons to contribute. Factor in the sleep deprivation, and we're never sure how many of her troubles are genuinely external. A compelling story… Lance Doty's script is laced with sharp, witty dialogue.